This is the last entry on "Sanada maru". Though I will write about something concerning the series from now on, the one mainly about the series finishes with this. I can manage to finish it until the end of the broadcast of "Onna Joshu Naotora" somehow. 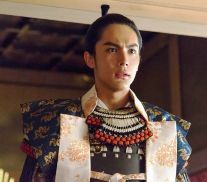 Sanada Nobushige in "Sanada Maru"
As the series is written by Koki Mitani, there are some jokes and styles that characterises his story. And the new theories about the Sanada clan are included. 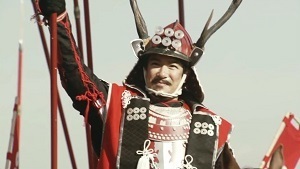 Like many other Taiga drama series, some scenes are based on the historical facts and the others are fictional. Main character is SANADA Nobushige (later Yukimura) but his father Masayuki acted by Masao Kusakari is a key person who is a schemer and skillfully deceives his enemy. It's true that his character attracted and still attracts the viewers. After his death in the 38th episode, the atmosphere changes and becomes rather dull despite the scene of the Siege of Osaka. 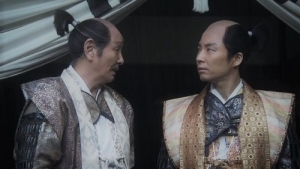 And TOKUGAWA Ieyasu acted by Seiyo Uchino is well described. Not only Ieyasu, his vassals HONDA Tadakatsu (Hiroshi Fujioka) and HONDA masanobu (Masaomi Kondo) are good also. Though Kiri (Masami Nagasawa) is noisy at first, she becomes to be reliabe as the story develops. 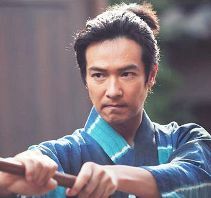 To tell the truth, the series is not heavy and the combat scenes are not so good as is usual with the script of Mitani. But The comical descriptions and the public relation succeeded to make the series gets into the news and Ueda City became to be well known thanks to it. The images are from the DVD series of "Sanada Maru" and the official website of the series. The Siege of Osaka is a series of battles fought between the Tokugawa clan and the Toyotomi clan from 1514 to 1615. The battles in 1614 are called "Fuyu no jin" (the winter campaign) and those in 1615 are called "Natsu no jin" (the summer campaign). Tokugawa Ieyasu, who became a shogun (Sei-i taishogun) in 1602 is said to have planned to destroy the Toyotomi clan but there are some theories about it. The immediate cause was the inscription on the bell of Hokoji temple. He insisted that there are some words that cursed him and some other words praised the Tototomi clan. Then Toyotomi Hideyori sent Okurakyo no Tsubone, nurse of his mother Chacha (Lady Yodo) to account for it. Ieyasu welcomed her and listened to her. On the other hand, he pressed KATAGIRI Katsumoto, vassal of Hideyori to explain it. As a result, Katsumoto was not trusted by the Toyotomi clan and became to serve the Tokugawa clan. Finally the negotiation between them fell apart. Then Hideyori gathered many ronins, most of whom were daimyos and their vassals beaten in the Battle of Sekigahara. SANADA Yukimura was included in them. He constructed a fort Sanada maru at the south of Osaka Castle and beat some daimyos under Tokurgawa Ieyasu in the winter campaign. But Ieyasu shot a cannonball to Osaka Castle and astonished Chacha, then both sides make peace and the soldiers of the Tokugawa Army destroyed Sanada Maru and filled the moats of the castle. After that, some od Hideyori's vassals were out of control and triggered off the summer campaign. In it, Toyotomi side ran out of provision and money and they were forced to fight tough battles. And Hideyori was not allowed to go out and command his army by the women in the castle. Meanwhile, many ronins were defeated and Yukimura tried to kill Ieyasu but couldn't. The final battle was about to end and he went to Yasui Shrine. When he took a rest there, he found NISHIO Munetsugu, who served Echizen Matsudaira clan and told him to bring his head to his lord. Some say that Munetsugu fought against and killed him and then found it's Yukimura. And Sen went to the headquaeter of her grandfather and father to beg for Hideyori's life but was in vain. In "Sanada Maru", SANADA Nobushige is asked to join the ronins who gather in Osaka Castle. He, GOTO Matabei, Mori Katsunaga. Chosokabe Morichika and AKASHI Teruzumi are called the Osaka Five (Osaka Goninshu) and have their own troops. 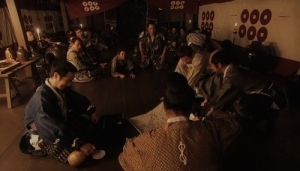 He proposes to Hideyori that they should not sustain a siege but is disagreed by ODA Urakusai, uncle of Chacha. Then he plans to construct Sanada Maru to defend the southern part of the castle. He, his son Daisuke and his vassals fight against the troop of II Naomasa well and win in the winter campaign. But Ieyasu shoots a cannonball to Osaka Castle that killed some of the maids of Chacha. Then his concubine Ahca no Tsubone makes peace with Okurakyo no Tsubone ignoring Hatsu, younger sister of Chacha who also participates in the negotiation. Then Sanada Maru is destroyed and the moats are filled. In the next year, some radical samurais dig up the moats and the ronins buy arms including guns with the lump sum to tranquillize them. But it provokes Ieyasu and causes the battle again. Though the Toyotomi Army fight well, the Tokugawa's side is overwhelming. At last Yukimura kills himself in Yasui Shrine and it makes his brother Nobuyuki sad. His wife Haru, daughter Ume and second son Daihachi is sheltered by DATE Masamune. There are some fictional parts as the secret love of Yukimura and Chacha, the relationship with his "eternal partner" Kiri, and the assassination of the double of Tokugawa Ieyasu in the series. And also in the series, Sen is sent to his father's headquarter but doesn't beg for her husband's life. (*) Though Kiri is modeled on a real person in the history, she is described as a woman who is free and behaves provokingly. The images are form the DVD series of "Sanada Maru" and the official website of the series. The siege of Ueda in 1600 was a battle of SANADA Masayuki and the army of TOKUGAWA Hidetada. Hidetada advanced to the west to fight against the West Army, led by ISHIDA Mitsunari. On the 2nd of September 1600, Hidetada approaches Ueda and SANADA Masayuki, lord of Ueda Castle appealed for mercy to him. But on the following day, he provoked Hidetada and they entered a state of war. 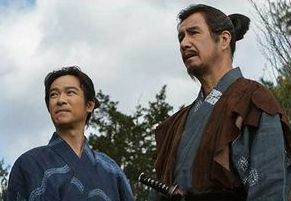 Sanada Masayuki (Masao Kusakari, left), Nobusgige (Masato Sakai) and TAKANASHI Naiki (Takeo Nakahara) prepare for the battle. SANADA Nobuyuki, heir of Masayuki took the side of Tokugawa after the parting at Inubushi. But he did not want to fight against his father and younger brother Nobushige.Then he fought against them on the surface and shut himself in Toishi Castle. After that, Hidetada's soldiers began karita-rozeki (*) to lure Sanada's army out from the castle. As they anticipated, some soldiers go out and attacked by them. Hidetada's men approached the main gate of Ueda Castle but they were attacked by the army of Masayuki with matchlocks. And the vans of Hidetada's army who tried to retreat encountered the rears and it made them be at a complete loss. Besides a dam, previously constructed on the upper reaches of Kan River was broken and the water gushed out. It drowned many of Hidetada's soldiers. And a skirmish still continued in the aftermath. In "Sanada Maru", Nobuyuki and Nobushige fight on the surface based on historical fact. 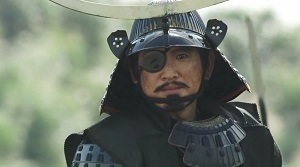 After Nobuyuki shuts himself in Toishi castle, Nobushige and his vassals conduct guerrilla war and attack the bases of the Tokugawa's side thoroughly. Hidetada's soldiers are in the tight corner and to make the matter worse, Kan River raises as a result of the long rain. Much rainfall is not unusual there in autumn. Hidetada who realises that he was trapped by Masayuki leaves there and hurries to Sekigahara though he was late for the battle. "It needs to prepare for the battle perfectly before it begins," says Masayuki. And the Sanada Army have a party to celebrate their win. When it is in full swing, Sasuke appears and tells them that the West Army was defeated at Sekigahara. It dumbfounds all of them. (*) Karita rozeki is a strategy that soldiers lure their enemy out of the castle by reaping crops, especially rice irregularly. It means that they have the right of controlling the territory. Nobuyuki puts up at a nunnery in Buddhism for a night on his way to Edo. But he is asked by a nun to share the room with HONDA Masanobu, who returns to his fief. During the night, he cannot sleep well because of Masanobu's breathing and sleep-talking. And at Osaka Castle, Sanada Ten Braves of Sanada encourage themselves but Yukimura, who appears with Sasuke there tells them not to die in vain and they go to kitchen to kill OSUMI Yozaemon. Yozaemon served ODA Nobunaga and TOYOTOMI Hideyoshi as cook. But he becomes to hate Hideyoshi because his wife and daughter, both of whom were raped by him and killed themselves. So he plans to destroy the Toyotomi clan. Then Yukimura slashes at him but he sticks his stomach with a bamboo skewer. After that, Yukimura meets Chacha before the Toyotomi Army departs the castle. 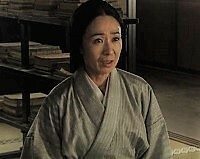 Chacha says that she is not afraid of death but becomes to frightened when Yukimura tells her what the real death is. He tells her that those who always have a hope can clear his/her own future. Yukimura worries whether he can distinguish himself or not but TAKANASHI Naiki says that a man's worth is decided by historians. Chacha plays karuta, a kind of card game with Kiri and says that Saemonnosuke (Yukimura) said to her that he would win the battle. And in the headquarter of TOKUGAWA Ieyasu, HONDA Masazumi rumours that Yukimura took the side of Ieyasu. 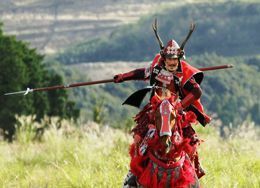 Though Yukimura views the war situation optimistically, he hears that MORI Katsunaga fights back the attack of MATSUDAIRA Tadanao, grandson of Ieyasu. Katsunaga approaches the base of SANADA Nobuyoshi but he won't fight back because he is not ordered to do so. Nobumasa, who becomes impatient and tries to attack him but he and his soldiers routs the daimyos under Ieyasu. Yukimura tells Daisuke to return to the castle and ask Hideyori to go out and command the Toyotomi Army but opposed by Okurakyo no Tsubone. 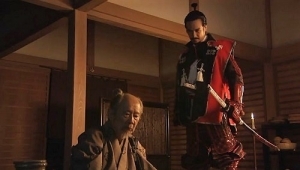 Besides, Yozaemon tells Hideyori that Yukiramura is a spy of Ieyasu and picked him with a skewer. At the same time, Yukimura takes up arms as if he tries to deny the rumour of his betrayal. Nobumasa is scolded for his behaviour but Nobuyoshi pleads for him. 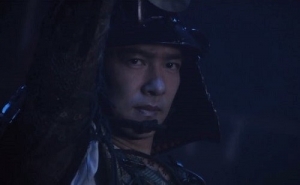 Then he goes out again and sees the troop of Yukimura advance to the base. YAZAWA Sanjuro feels the pricks of his conscience in fighting against them but Yukimura evades him and continues advancing. Then Ieyasu and Hidetada escape from their headquarters. However the Toyotomi Army, who takes the initiative in the battle retreats to the castle with Hideyori's umajirushi, a kind of standard and it confuses the side of the Toyotomi. It makes the disturbance in the castle. Obviously, taking back umajirushi is owing to the chaotic chain of command. 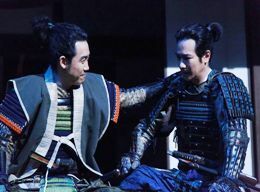 Daisuke is blamed that his father Yukimura betrays his lord but Sasuke insists that it's Yozaemon who betrays Hideyori. 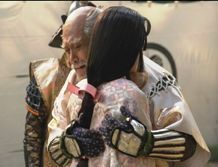 As time goes by, the flow of the battle changes and the Toyotomi Army is forced to have a hard time but Chacha prevents her son from going out and tell him to survive. Meanwhile, Sen and her maids are led to Ieyasu's headquarter by Kiri and soldiers. On their way, Kiri sees the battle of Yukimura and the Tokugawa Army. On the other hand, Yozaemon fires the kitchen. TAKANASHI Naiki fights against the soldiers under Ieyasu who invade the castle and dies holding Masayuki's mortuary tablet in his hand. Sakubei fights well despite being shot again and again but dies at last. Yukimura points his flintlock at Ieyasu but is told that it's not the time to decide anything by fighting now. He says that he should shot him but fails and then he is shot on the contrary. There appears Hidetada with his soldiers with guns. Sasuke explodes a bomb to lay a smoke screen but in vain. DATE Masamune, Uesugi kagekatsu and Naoe kanetsugu (**) see the scene at a distance from them. Kagekatsu is impressed by Yukimura and Kanetsugu says all is over. Yukimura goes to Yasui Shrine accompanied by Sasuke and is about to commit hara-kiri. Then Osaka Castle is wrapped in flames and falls. At the same time, Haru departs from the headquarter of Masamune with her children, and Sue lives happily with her husband. Sen feels happy to meet her father and grandfather again. After the war, Nei, who becomes to be called Kodai-in hears about the winter and summer campaigns from KATAGIRI Katsumoto. And Nobuyuki, who talks with Masanobu sees a post horse and is told of the death of Yukimura. (*) Though the episode is titled "Shippu" (gale)in the guidebook, it's not used when it's on the air. (**) Date Masamune participated in the summer campaign but Uesugi Kagekatsu and his vassal Naor Kanetsugu stayed in Kyoto to protect the Imperial Palace in reality. The images are from the DVD series of "Sanada Maru". She was a wife of SANADA Yukitaka (Yukitsuna), mother of Masayuki and grandmother of Matsu (Muramatsu Dono), Nobuyuki and Nobushige (Yukimura). She is the same woman as Shinome in "Furin Kazan". She was a younger sister of KAWAHARA Takamasa who served Yukitaka. He is said to have married her in the early 1530s. They had five sons include Masayuki. In 1582, ten years after the death of her husband, the Takeda clan collapsed. In the confusion after that, she became a hostage of some daimyos as TAKIGAWA Kazumasa, KISO Yoshimasa and TOKUGAWA Ieyasu. Around 1585, she could return to her family. She died in 1592 or 1593. In this series, she is described as a woman of strong character. She enjoys her life as hostage as she pleases. She is also an influential woman in the Sanada clan and values family ties to survive. Her idea is handed down to Masayuki, Nobuyuki and Nobushige. Though being severe to Kaoru (Yamate Dono), wife of Masayuki, she is a playful personality. The image shows Mitsuko Kusabue as Tori. SANADA Nobuyuki tells his wife Ina (Komatsu hime) that he will go to Osaka to meet Yukimura. She asks him to return home alive. The Osaka Five decide to engage the enemy at Osaka Castle. 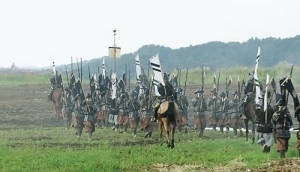 GOTO Matabei, AKASHI Teruzumi and their troops advance to Tennnoji, that is located south of the castle. And Yukimura suggests breaking some banks of Hirano River that flows near the castle to keep their enemy away. "You should live as you like." "He should not have been too eager for success." The bad rumour of Matabei is a trick of HONDA Masanobu. Besides, it seems that the strategy of the Osaka five is leaked out despite the disappearance of ODA Urakusai. It is OSUMI Yozaemon, a cook who is in charge of the kitchen who communicates with Ieyasu secretly. Yukimura and his comrades often use the kitchen to discuss their plan while dining. Yohachi, childhood friend of HOTTA Sakubei who helps Yozaemon happens to know his real nature and is killed by him. "Have you already finished your battle? Isn't there any true samurai in the Tokugawa's side?" Then he also retreat to Osaka Castle. Masamune sees him with favour. Yukimura thinks that Masamune is trustworthy and then tells Haru, Ume and Daihachi to go out to be sheltered by Masamune. He tells Kiri to take Sen to her father Hidetada if the crunch comes and then return to Numata. But she says that she will return to the castle. "I will serve Yodo Dono (Lady Chacha) until the end because I don't want to survive without you." At that moment, Yukimura draws Kiri closer to himself. "It's too late," says Kiri. Hideyori praises Yukimura for his exploit. But he tells Hideyori to be cautious and make Ieyasu irrititated. And Hatsu (Joko-in), younger sister of Chacha asks Yukimura to persuade her to be calm. She seems to believe that she will die in the flames of war like her parents. Ieyasu orders SANADA Nobutada who serves him to scheme Yukimura to betray Hideyori. Nobutada thinks it's impossible but it makes him happy to meet his nephew for the first time in more that twenty years. 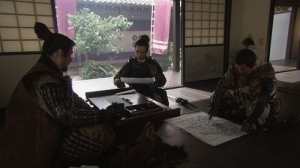 Then he hands letter of Ieyasu to him. It says how he will treat him when he betrays Hideyori. Nobutada tells him that he doesn't need to read it and later tells Ieyasu that it results in failure. ODA Urakusai supposes Hideyori, Yukimura, Ono Harunaga and his mother Okurakuyo no Tsubone that they should make peace with Ieyasu because it's the golden opportunity to do it. Though Hideyori hopes to postpone it, he finally agrees with the negotiation. But Chacha refuses it strongly. Yukimura who wants to triumph Ieyasu is not keen also thinks so. Then Ieyasu orders his soldiers to fire a culverin and its cannonball hits the keep of Osaka Castle where Chacha lives. The hit kills some of the maids of Chacha and it unsettles her mind. It is the plot of Ieyasu to threaten her and from this, the trend towards making peace with Ieyasu becomes to grow. Hideyori says that he will accept the condition however it's inconvenient for him if the world becomes peaceful. Ieyasu says that he hopes reconciliation on the surface but in reality he plans to pressure Hideyori to obey him and make the castle defenseless. Urakusai hopes to sit at the negotiation table but Yukimura stops it because he feels him suspicious about him. Then it has been arranged that two women, Acha no Tsubone, concubine of Ieyasu and Hatsu discuss what to do after the battle. But Hatsu is ignored and Acha no Tsubone makes Okurkuyo no Tsubone, who accompanies Hatsu agree with her idea and it's decided that the moats of Osaka Castle are filled. Because of this, the castle becomes defenseless. Yukimura droops his shoulders but his comrades in arms encourage him. Espacially Hideyori says that he will continue fighting against Ieyasu, quoting Yukimura's word "Those who always have a hope can clear his own future". It makes Yukimura renew his determination. GOTO Matabei and MORI Katsunaga assault the headquarter of Ieyasu at night. On the other hand, Urakusai tries to inform Ieyasu that some ronins will attack him on the following day. But he is detected that he is a spy of Ieyasu by Yukimura and leaves Osaka Castle. Sasuke attacks Ieyasu and kills him but it is his double. Hideyori's vassals worry that the provisions in Osaka Castle become to decrease and ronins are eager to fight against Ieyasu again. Then Hideyori permits them to meet their wives and children to make themselves at ease. Meanwhile Yukimura plans to construct a new fort. And he also visits his nephews, sons of Nobuyuki with Daisuke. He meets them at the headquarter of Nobuyoshi. He is a gentle young man but his brother Nobumasa is rude and opposes Daisuke. After returning to Osaka Castle, Yukimura finds something at the corner of the garden and finds it is a flintlock (*). Yukimura hurries Hideyori and ONO Harunaga up to prepare for next battle to take back some of Toyotimi's territories to supply the provision. And ronins are given money from the treasury by Ono Harufusa and purchases guns. Soon after Nobuyuki receives a letter from Yukimura that hints at his death. (*) It is Sen no Rikyu who buried it before his execution because his seal is put on the box containing the flintlock. 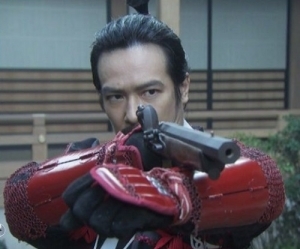 The image shows Masato Sakai as Sanada Yukimura shoots a flintlock. TOKUGAWA Ieyasu who stays at Nojo Castle asks KATAGIRI Katsumoto about the ration in Osaka Castle. He says that there is only six-month supply of ration in store. At Osaka Castle, KIMURA Shigenari, one of the vassals of TOYOTOMI Hideyori suggests holding the castle. ONO Harunaga, ODA Urakusai and the Osaka Five except Yukimura agree with it but Yukimura is dissatisfied. To begin with, Hideyori has no reinforcement to support him during the siege. And Yukimura plans to divide and confuse the enemies much more than Hideyori’s army in number. However Harunaga uses something that profits some of the Osaka Five as lures to make the agree with the holding the castle. Then Yukimura proposes to Harunaga that thsy should fight against the Tokugawa Army outside the castle to protect the Toyotomi clan. Though Urakusai shows disapproval,　Hideyori agrees with his plan at last.However Chacha insists holding the castle and Yukimura has to work out another measure. 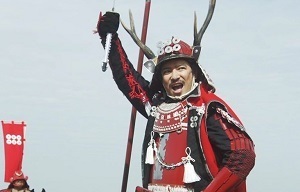 Yukimura finds that the defense of south side of the castle should be strengthened. He plans to construct a fort there but Matabei has the same idea. However Yukimura plans to construct it to win while Matabei intends to die brilliantly in the upcoming war. 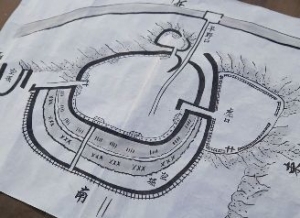 Yukimura shows him his plan of the fort that is designed to slow the advance of enemy. Not only Matabei, but Hideyori is satisfied with the plan also. But Okurakyo no Tsubone, who always looks down on the ronins suspects Yukimura who has such an idea. Then Harunaga and Shigenari don’t allow the ronins to take up the position and Yukimura’s plan of constructing a fort is cancelled. 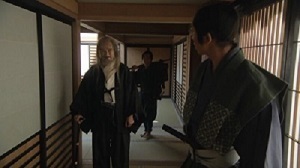 Urakusai also tells Hideyori that he should not trust Yukimura because his father Masayuki was a man who promoted himself by betraying many people. The winter campaign of the Siege of Osaka began but Hideyori’s army is defeated by that of Tokugawa. It seems that somebody communicate with the Tokugawa Army secretly. Yukimura becomes to suspect Urakusai. And he tells Haru, Ume and Daihachi not to go out of the castle. Kiri becomes a maid of Chacha. Sanada Maru is a great menace to TOKUGAWA Ieyasu. Then he orders Uesugi Kagekatsu who was closed with Yukimura to attack him with the Sabadas’ soldiers. Sasuke hands a secret letter to Yukimura and he tried to avoid fighting against his family. Then he plans to put his enemies up and then make themselves overreach as his father Masayuki did in the Siege of Ueda in 1585. He beat the enemies with HOTTA Sakubei with many soldiers perfectly. It moves UESUGI Kagekatsu though he is his enemy now. 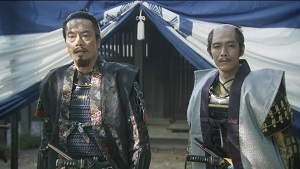 Uesugi Kagekatsu (Keinichi endo, left) and his vassal Naoe Kanetsugu (Shingo Murakami) see Yukimra and Sanada Maru. 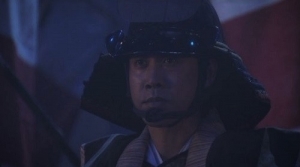 (*) In the scene, Takanashi Naiki finds the soldiers wear red armours in the enemy's position. Yukimura tells him that it's the army of the Iis and the clan must have their own history as the Sanada clan have. Naiki tells his master that he would like to hear about them. Many viewers thought it's the public relations of "Onna Joshu Naotora". She was a daughter of SANADA Nobutsuna, heir of Yukitaka and the eldest brother of Masayuki. She was a wife and became to a concubine of Sanada Nobuyuki and a mother of Nobuyoshi. She married Nobuyuki after her father was killed in the Battle of Nagashino. It is thought that Masayuki, new heir of the Sanada clan took leaving offspring of Nobutsuna into account. Later she became a concubine by the marriage of Nobuyuki and Ina (Komatsu hime) to strengthen the relationship between the Sanadas and the Tokugawas. She died in 1619. In this series, she is of a delicate health but becomes to be healthy later (*). 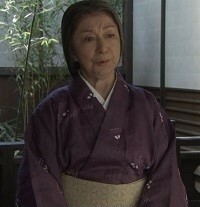 After the marriage of Nobuyuki and Ina, she serves her former husband and understands Ina. She gives birth to Nobuyoshi one month earlier than the birth of Nobumasa, son of Nobuyuki and Ina. (*) The change of her appearance attracted the viewers of "Sanada Maru".